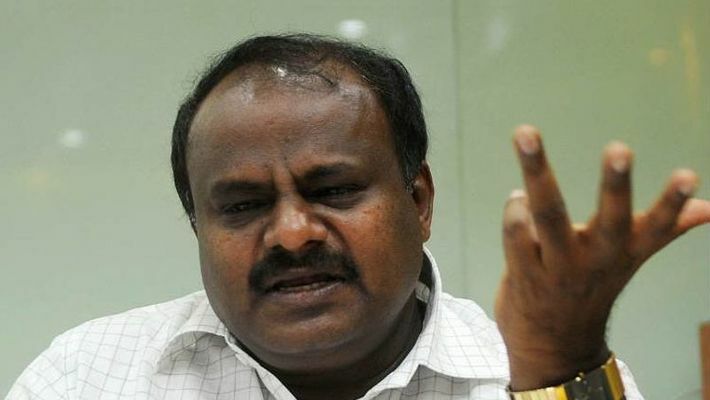 Bengaluru: Smoke was detected in chief minister HD Kumaraswamy's Range Rover car in the wee hours of Thursday. But the security staff noticed smoke coming out of the car and asked him to alight the vehicle in time. The incident occurred when Kumaraswamy was travelling to Pee Halli village near Srirangapatna in his lucky car. After the security staff noticed smoke emanating from the car, Kumaraswamy was made to travel in another car, keeping the safety of the chief minister in mind. The exact reason for the fire accident is not known. But it is said that the residents of the village had burst crackers to welcome the chief minister. This might have ignited the fire. There are also reports that it might just be a technical glitch in the car. Kumaraswamy is busy campaigning for his son Nikhil Kumaraswamy, who is contesting the Mandya Lok Sabha seat on the JD(S) ticket. The constituency has become a matter of pride as Nikhil is up against independent candidate Sumalatha Ambareesh, who is supported by the BJP. Mandya is touted as one of the most fiercely contested constituencies out of the 28 going of election in the state. Mandya is going for vote on April 18 in the first phase of election. Kumaraswamy’s MLA wife Anita Kumaraswamy is visiting various temples in the state, seeking divine blessings for son Nikhil’s victory.